The master cladders at Ford Motor Company have left almost everything to the imagination with this spy shot of the next-generation F-Series pickup, which is expected to debut for the 2009 model year. But as the truck moves into final confirmation prototypes, a number of them were caught road testing—in three cab configurations. Spotted in Detroit have been standard short cab, extended cab (like the one pictured here), and four-door crew cab ’09 versions, suggesting Ford will be ready to rumble with a full lineup when the trucks launch next year. The current generation launched for ’04 as what amounted to five different pickups, each with distinct interiors to appeal to diverse buyers—including, for the first time, luxury vehicle buyers. Ford was acting on research that said luxury buyers want maximum luxury, sportier guys want ultra sport, and buyers of a base truck want it really stripped down. And, in the end, it proved mission impossible. 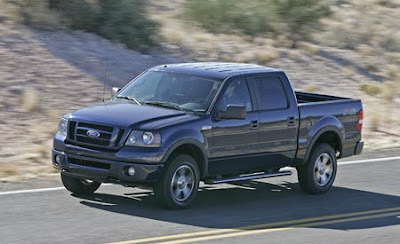 The closest Ford came to the million mark was in 2004, when the new truck was fresh and exciting, and the automaker sold 891,000 light duties and 940,000 with heavies added. Sales have tapered off ever since, and through April of this year, light-duty F-Series deliveries are running 10.4 percent behind year-ago’s pace, according to Wards Automotive Reports data. The F-150 is the automaker’s single-largest profit contributor, at about $5,000 per unit on annual sales in the 800,000 range—which means Ford can’t afford not to redo its bread-and-butter vehicle. What is it with manufactureres these days delaying the good powertrains? First it was GM who didnt have the 6 speed available for mass consumption, now Ford apparently wont have the big V8 offering nor the anticipated diesel. Hopefully the carryover V8 nor the new 6.2 will spit out Ford catalytic converter and spark plugs like existing/past V8 offerings.